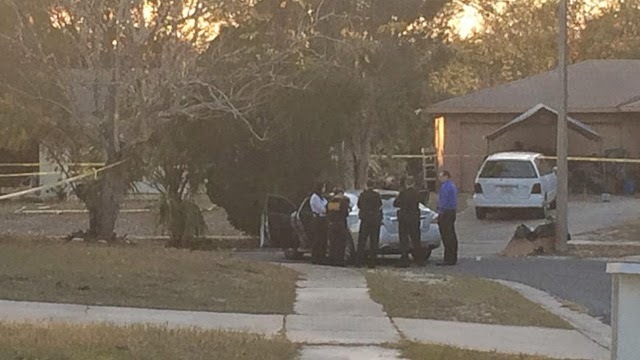 Two men were shot in a Pine Hills neighborhood Sunday afternoon, according to the Orange County Sheriff’s Office. Deputies said three men were riding in a silver Nissan shortly before 4 p.m. Sunday when two of them were shot at the intersection of Powers and Ambassador drives. A 21-year-old man was transported to Orlando Regional Medical Center by ambulance, where he died. The second man in his 20s who was shot was hospitalized with non-life threatening injuries. “We have no reason right now to believe that it was random,” Lt. Paul Hopkins said. The driver, who wasn’t shot, had minor injuries from shattered glass. Officials said he drove to nearby Wedgewood Circle, seeking help. “We were sitting in my friend's garage just talking and I heard some rapid gunfire, and then we saw a car just [going] down the road real fast,” witness Tony Pinnock said. Homicide and forensics investigators spent the evening processing evidence at the scene, but deputies said they’re still searching for the gunman.